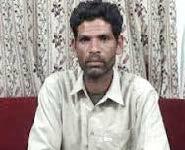 Sawan Masih (31), a Christian street sweeper and father of three from the city of Lahore in Pakistan, was sentenced to death for blasphemy in March 2014. He has been in prison since March 2013. LATEST NEWS (April 2019): Sawan’s appeal was due to be heard on 3 April, but his case was adjourned due to the non-availability of a judge of the Divisional Bench of Lahore High Court. The next date is pending. The day after the conversation, Shahid Imran claimed that Sawan had blasphemed against the Prophet Mohammed. Press reports said a mosque broadcast the accusation via loudspeakers, and local Muslim factory workers went on strike for Sawan’s arrest. A mob of more than 3,000 angry Muslims attacked Sawan’s home and looted and torched 180 Christian homes, 75 shops and at least two churches. Hundreds of families were displaced – the mob threatened to burn Christians in their homes unless they left, so they all fled. Sawan was handed over to the police, and has remained in detention ever since. Joseph Colony residents and Christian rights activists claimed that a local politician from Pakistan Muslim League-Nawaz played a central role in the attack to facilitate a land-grab by local factory owners who supported him. Sawan’s trial was held in prison in Lahore due to security concerns. In his court statement, he said he had not committed blasphemy and accused Shahid Imran, the complainant, of involving him in a fake case as part of a plot by local businessmen to use blasphemy allegations to drive Christians from Joseph Colony so they could seize it for industrial use. “They hatched a conspiracy to push out the residents of the colony,” he told the court. “They contrived a case and got it filed by a person who was close to me. I am innocent.” Judge Chaudhry Ghulam Murtaza sentenced Sawan to death and fined him 200,000 Pakistani Rupees (approximately €1,500). Rights groups and lawyers criticised the death sentence and said the case for the blasphemy conviction was weak. Sawan’s chief lawyer Naeem Shakir said the conviction was not based on justice. Tahir Bashir, another lawyer on Sawan’s defence panel, said he believed the judge had convicted his client under pressure from local Muslim political and religious groups. Sawan’s appeal is pending in Lahore High Court. He is being held in the Central Jail in Faisalabad, 140 km west of Lahore, but his mother Billo Bibi says the authorities are considering moving her son to a jail even farther away, in Sahiwal, which will make travelling to visit even more difficult. On 29 January 2017, an anti-terrorism court in Lahore acquitted all 115 suspects who had been accused of participation in the attack on Joseph Colony, due to lack of evidence. Anti-terrorism judge Chaudhry Muhammad Azam acquitted the suspects after prosecution witnesses said they were not the ones responsible. He ordered all charges to be dropped despite strong evidence against the suspects, including video footage of the attack. All the suspects were already out on bail. Sawan’s wife Sobia and their three children have moved in with her family. Muslims stoned Sawan’s house after Friday prayers on the day of the Joseph Colony attack, and brutally beat his elderly father, who has developed breathing complications since Sawan’s arrest and does not speak anymore. 8 March 2013 Sawan Masih was accused of insulting the Prophet Mohammed during a conversation with a Muslim friend. Sawan was handed over to the police. 9 March 2013 More than 3,000 angry Muslims attacked the predominantly Christian Joseph Colony where Sawan lived, looting and torching 180 Christian homes, 75 shops and at least two churches. Hundreds of families were displaced. 27 March 2014 Judge Chaudhry Ghulam Murtaza sentenced Sawan to death for blasphemy and fined him 200,000 Pakistani Rupees (approximately €1,500). 29 January 2017 An Anti-Terrorism Court in Lahore acquitted 115 suspects who had been accused of participation in the attack on Joseph Colony. 28 January 2019 Sawan’s appeal was due to be heard on 28 January 2019, but the judge did not appear. A new court date was set for 27 February 2019. 27 February 2019 Sawan’s appeal hearing was postponed again. It was left over due to the hearing of other cases, and a new date of 20 March 2019 was set. It did not take place on that date, however, and was rescheduled for 3 April. 3 April 2019 Sawan’s case was adjourned due to the non-availability of a judge of the Divisional Bench of Lahore High Court. The next date is pending.